Boosted with Marine Collagen and Manuka Honey. Paraben free. Directions: Use day and night on the face and around the eyes to help eliminate wrinkles and other signs of ageing. Non greasy, easily absorbed, cooling and ideal for sensitive skin. 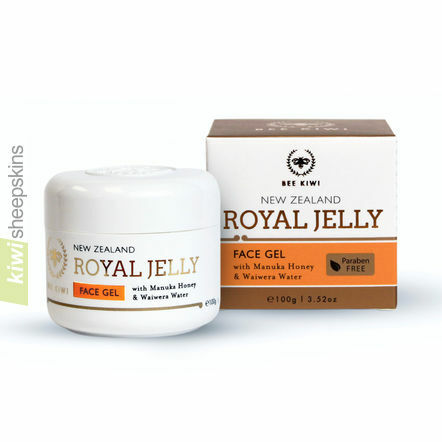 Royal Jelly Face Gel reviews/feedback. I have been trying some of your skin care products. Having my own bath and body product company I want to commend you on your ingredients and I love the products I ordered. Your company sets the gold standard, in my book, for product and customer service quality, speed of shipping and competitive pricing. I sing your praises to any who ask where to find top-notch gifts and health-related products. Well Done! I'll be back, as I have done for years. See more testimonials for our Nature's Beauty range.